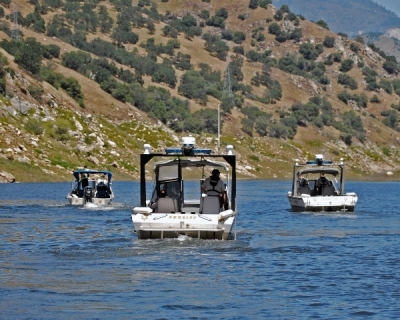 The Fresno County Sheriff's Office Boating Safety Unit has the primary responsibility for the enforcement of laws and regulations relating to the operation of watercraft within the County of Fresno. 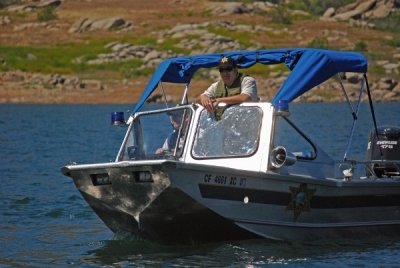 The unit patrols the areas of Shaver Lake, Pine Flat Lake, Huntington Lake and the Kings River. The unit enforces these provisions by means of patrol vessel, vehicle, and foot patrol. The boating unit currently has eight patrol vessels and two personal watercraft that are used for patrol and rescue operations. 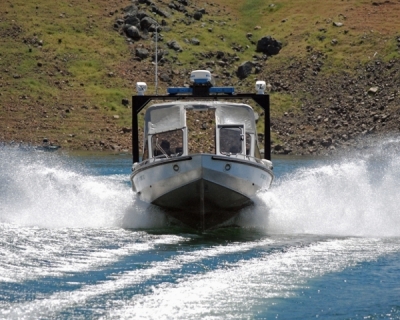 The patrol vessels are manufactured by Design Concepts and are 21 feet in length and constructed of aluminum. They are equipped with a Chevrolet 5.7-lt Mercury I/O. Our propellers vary in size, due to the elevation of the lakes. The vessels are completely equipped with navigation radar, depth finder and communication radio, and rescue equipment. The vessels can accommodate up to eight passengers, with room in the center of the cockpit for a medical board. The unit's goal is to educate the public on water safety. The boating unit utilizes "The Aqua Smart Program" which is one of the most current and up to date water safety programs in the state. The State department of boating and waterways developed the program, and it has been in use since 1992. The water safety program can be presented to children and young adults in their classrooms (grades K-8). The unit is also available to give presentations that would include Boating Laws and water safety pertaining to all age groups. 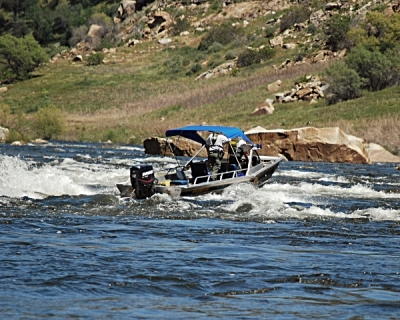 The Boating units patrol function is to promote a safe boating experience for all involved. 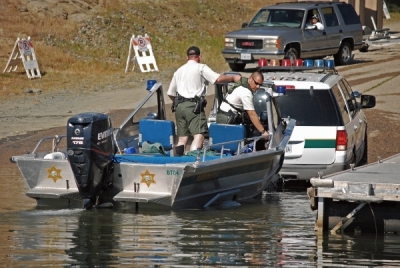 While on patrol, the deputies conduct inspections on vessels for required equipment and registration. 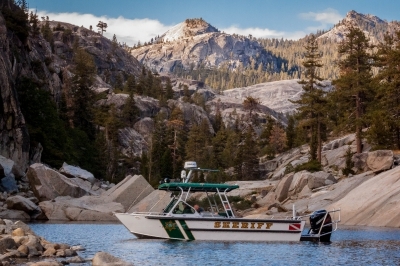 Below is summary of the required equipment and some of the rules and regulations applicable to most boaters on the lakes and rivers of Fresno County. It is by no means a complete list; however, it is indicative of the laws most commonly violated and/or misunderstood. Children under the age of 12 must wear a Coast Guard-approved life jacket when aboard and underway vessel 26 feet in length or less. Exceptions: on a sailboat, if the child is in an enclosed cabin, or restrained by a harness tethered to the vessel. Bell, horn, whistle, or other device capable of making an efficient sound signal. Required on in-board gas motors which are not exposed to atmosphere above the gunwale. An effective muffling system is required for the exhaust for every engine. Must be red or orange, at least 12" x 12", square or rectangle. Skier in water preparing to ski. A ski line in water. A ski or ski device in water near boat. Three people are required for water skiing. Observer must be at least 12 years of age. Vessels with 15 hp or less. 12- to 15-year-olds may operate with an 18 year old adult, who must be on board and supervising the operation of the vessel. Counter clockwise on all Lakes and rivers. 50 mile-per-hour daytime speed limit on Pine Flat, Shaver, and Huntington lakes. 5 mile-per-hour nighttime speed limit on all waterways in Fresno County. No Wake Zone: No wakes allowed, or a 5 mile-per-hour maximum speed limit. 5 mile-per-hour speed limit within 100 feet of any swimmer, or 200 feet of swim beaches, swim floats, docks or launch ramps. Navigational lights required between sunset and sunrise. Riding on the BOW, GUNWALE, OR TRANSOM is prohibited. Reckless or negligent operation of any vessel is prohibited. 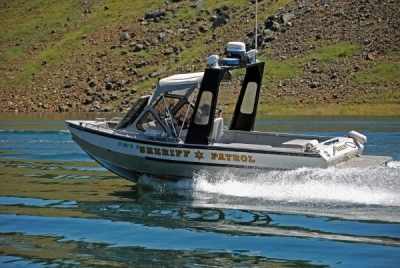 Operating a vessel or skiing under the influence with a blood/alcohol content of .08% or more is prohibited. 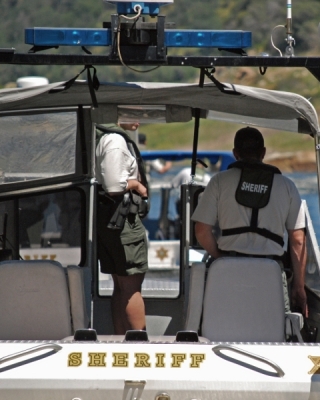 Any person convicted of one moving violation while operating a vessel shall be ordered by the court to complete and pass a boating safety course approved by the Department of Boating a Waterways. CLOSED AREAS TO VESSELS, RAFTS, CANOES , ETC. The Boating unit promotes a better public awareness in the safe use of watercraft and the potential danger in the unsupervised use of water related activities (with special attention given to small children and young adults). The main objective is educating the public in water safety. DBAW provides safe and convenient public access to California's waterways and leadership in promoting safe, enjoyable and environmentally sound recreational boating.